AVANTI Dentistry (Tysons Corner) - Book Appointment Online! Dentistry of the Future: Anything You Need Under One Roof! 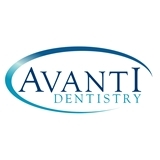 At AVANTI Dentistry we take a new approach to dental care. In a relaxing atmosphere, we provide personalized, gentle care using state-of-the-art technology and advanced solution to give you the smile you desire. What makes AVANTI Dentistry different? -Same day crowns. That's right-no impressions, no temporaries, and no return appointments! -We offer up to one year interest-free financing -We offer In-House Dental Coverage for Non-Insured Patients -All General Dentistry & Specialized Services in one convenient location! -Convenient Hours As Early As 7am & As Late As 7pm & Saturday Hours! Your untreated dental work will ONLY get more expensive. Call AVANTI Dentistry today and let us know how we can help you! Services We Offer: Please go to www.AvantiDentistry.com for more information!